Though I am still the shape of a mom full term, the energy I feel, reminds me this baby is no longer using my every resource. We sit in registration’s office, first door on the left, through the locked double doors that open into Labor and Delivery. We are giving names and birthdates, allergies and addresses. Other times in the past 40 hours we have sobbed and held onto a belly, with a baby present and already gone. We held tight to each other and I found, how I was being held tightly by my Maker. There is calm and choice in coming this morning; This day that means hello to a lifetime saying so long. I sit on the hospital bed and wait. 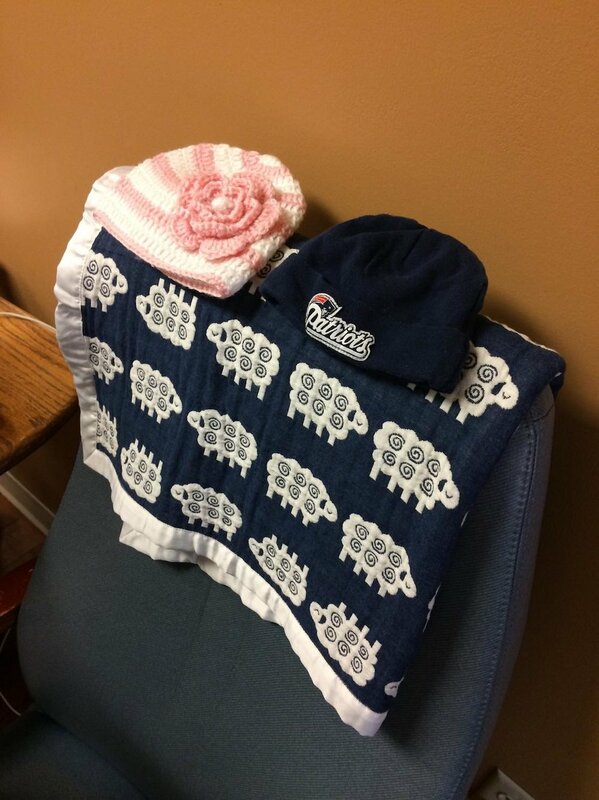 On the chair next to me, are the two tiny hats and two baby blankets. If you are Simeon, our son, we will put that Patriots blue on you - a Pats boy, just like your dad and all his brothers. If you are Esther Faith, then the sweet little pink, with the flower of course. One blanket is the handmade Winnie-the-Pooh we have swaddled our first two in, to soothe them to sleep, laid them to play, covered them to keep warm. The other was handpicked for you little Lamb, last night, when we knew we’d wrap you up just once. Across from me, I am amazed at the soothing joy of the bouquet my sister has brought. Tulips in full bloom from her garden. They hold nothing back in their love - as wide and as vibrant of love as they can be, and I am captivated by their beauty. The world doesn’t feel dark. The flower song is right, they will be dead soon, but how they give music to my heart today. This chosen labor begins. Slow and light. Family is here. I am well. My husband sends each one away for now. I need to do this hard work, I need to focus. My mom stays. My mom with her hat that hints to strangers her fight to live through Leukemia. She is my great example of fight. I breathe deeply in and release all of it out. Relax every muscle, don’t fight back at this pain. My hands stay open: gentle, soft. Go with it, go with it. That is how a baby comes, that is how this baby will go. The lights are gentle, and the music is quiet, the room is peace, and I am willing to do this labor. I am working for you baby, like I did for your brother and your sister. It doesn’t feel different. I am working for you, my baby. My legs shake and ache, my mind is growing weary. It is hard to let go of so much pain, over and over again. I look at Mom. She says, “Five more contractions.” I think hard, wondering do I have that left? I nod. “Help.” I say, “Get me out of this.” The nurses move quickly to do this. The lady walks in who will administer the epidural. She doesn’t look like my nurses: kind and competent and strong. She reminds me of death: pale and unwell. She rattles off risks, complications - more death. My husband is on his knees in front of me, holding my legs, holding my pain, as much as he can. He is praying. I sign the paper. Right before numbness can come to take me away, right before she can pierce my spine, my river that keeps all of me feeling - there is a burst. You are laid on my chest, warm from my insides poured out. Warm and still. I am captivated by your beauty that fades in front of my eyes. Gifts: to look on and hold your hands and feet that have kicked and pressed, to see your eyes are like your brother’s, and mouth like your sister’s; to be surprised that you have your dad’s nose. To get to see you in this moment, this brief moment, cannot be taken from me. I will hold you forever my son.